Vitarade® EL fueled by Vitargo® is a unique carbohydrate drink fortified with electrolytes designed for professional athletes based on the most up-to-date scientific research. It delivers high molecular mass glucose polymers (Vitargo®) and key electrolytes to support your body during the physical activity. 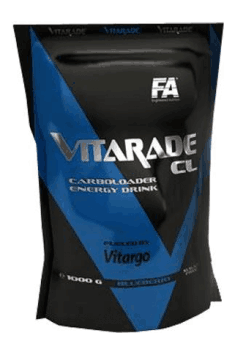 Vitarade® EL fueled by Vitargo® quickly delivers glucose to working muscles and replenishes the loss of electrolytes caused by intense exercise. To optimize your workout or competition performance, you need stable supply of carbohydrates (main source of energy for working tissues) because muscle and liver glycogen stores are utilized even during moderate activity. Moreover, proper hydration of the body is a crucial factor for its performance during the workout or the competition. Even 2% loss of body weight caused by dehydration can lower performance up to 5 – 10%, while 4% loss of body weight lowers performance by 20 – 30% (!!!). Providing the adequate amount of fluids during the workout protects the body from dehydration and postpones the fatigue. Acidity regulator (citric acid, sodium citrate), calcium gluconate, magnesium gluconate, natural flavour, potassium gluconate, sweeteners (acesulfam potassium, aspartame), coloring agent (beta-carotene).